A woman in a head scarf, 27 feet high, gazes piercingly from the side of a Brooklyn brownstone. A flock of spray-painted birds breaks free from shackles on a Manhattan building. 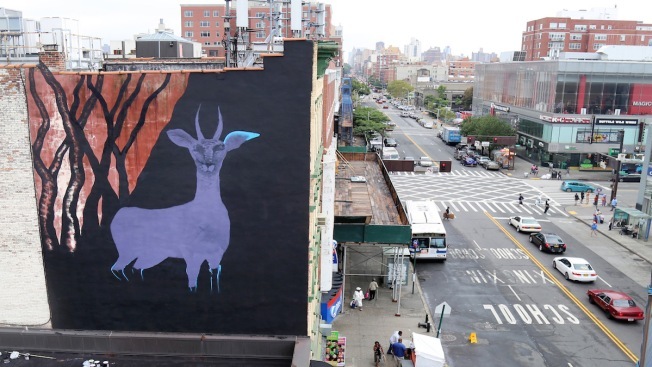 A Harlem mural shows a giant teal gazelle against a black background, barren trees and a peacock feather. They are among about a half-dozen murals painted around New York City and Jersey City, New Jersey, to draw attention to journalist Maziar Bahari's campaign for press freedom and educational access in Iran, where he spent 118 days in a jail after an appearance on "The Daily Show with Jon Stewart." Bahari, whose story was told in Stewart's film "Rosewater," hopes the art will attract the attention of diplomats attending the U.N. General Assembly and spark a conversation about human rights. He has founded a nonprofit group, Not A Crime, to focus on journalism and education for Iran's largest religious minority, the Baha'i, a group that believes in one God and emphasizes that humans are equal and diversity should be cherished. "We want to create a discourse in the city so when world leaders, different delegates come to New York in September, at least some of them will talk about the situation of the Baha'is in Iran, some of them will talk about the journalists in Iran," Bahari said. Bahari was working for Newsweek magazine in June 2009 when Iran's Revolutionary Guards took him from his mother's home in Tehran on espionage charges based on video of him joking with a "Daily Show" correspondent about being a spy. During four months in Tehran's Evin prison, he was beaten, held in solitary confinement and suffered psychological torture, he said. He was released on bail after four months and left the country. He later was sentenced in absentia to more than 13 years in prison on charges including spreading propaganda against Iran, collecting classified documents and insulting the supreme leader. With more than 30 imprisoned journalists, Iran is second only to China in jailing reporters, according to the Committee to Protect Journalists. Cases like those of Bahari and Jason Rezaian — a Washington Post reporter held in Evin prison for over a year on espionage charges — have spotlighted the issue. The Brooklyn mural is a likeness of Atena Farghadani, an artist and activist serving a 12-year sentence in Iran for creating a cartoon that criticized a law limiting women's access to birth control. The mural, created by artist Faith47, shows her without a mouth. Ron English is painting a large, official-looking warning suggesting that photography is not permitted. Street art is a perfect vehicle for delivering such political messages, he said: "Everybody experiences it." Argentine artist Marina Zumi, who created the Harlem mural, said she hopes the work sparks conversations about social justice. Passer-by Parris Douglas was drawn to the gazelle Zumi was painting. "I feel like this is liberating," he said after asking Zumi what prompted the mural. "It's the fact we're allowed to express how we feel with anyone saying or telling us what we can and can't do."